We asked you to tell us about them, and they are chilling. All illustrations by Neal Fox. Last week, we asked you to tell us about your nightmares. Sometimes, when people talk about their dreams, it can be hard to understand the weird worlds and emotions their subconscious minds serve up. But your nightmares are clear and vivid, and chilled us to the bone. You told us of tornadoes, disembodied hands, moms in peril, nuclear war, flaming eyes, hollow eyes, flaming hollow eyes, creepy old houses, falling elevators, giant spiders, giant tortoises, and giant jellyfish. In your nightmares, you are running away from rubber wolves, from Slenderman, from vampires, from a Chrissy doll. And sometimes you don’t get away. We received hundreds of nightmares, and we read every one. Here is a small sampling of what haunts you. 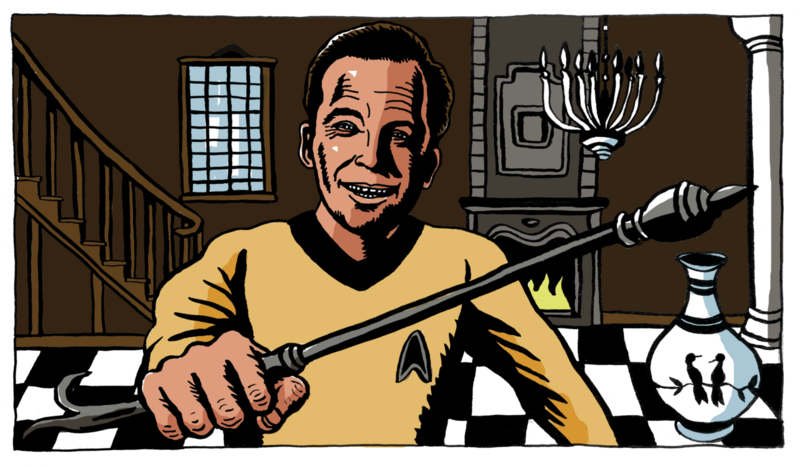 I had a nightmare that William Shatner was stabbing me with a fire poker. We were in a big fancy home in a study type room with expensive furniture and I’m being stabbed to death by a fire poker while Shatner is laughing and smiling maniacally. I’m still terrified of the man. I dreamt that I cut my own eyelids off with a pair of very blunt nail scissors. Someone wheeled a metal gurney onto a stone bridge in a park. My body had been barbecued, and it was laid out on its back on the gurney. My skin was crispy and covered with BBQ sauce. I was told to carve up my body as the main course for a catered picnic in the park. I hesitated for a minute, and someone whispered over my shoulder, “It’s much easier after you remove the hands and head.” So I cut off my own hands and my own head. The advice was right. It was much easier to carve up the rest of my body after that. I served up the slices to the people at the picnic but I didn’t eat any of it. Fist-sized houseleeks (also called sempervivum) are growing out of my armpits. If I pull on them or trying to tear them off, they bleed heavily. I was driving down a specific street in my home town. Ahead of me I saw a pedestrian crossing the street. As I approached, she turned … and it was also me. I drove over myself. Walking in a forest glowing with lanterns. However, when passing a lantern, I realized it’s made out of human skins pulled taut over a wire frame, crudely stitched together. I can see the shocked and pained faces on certain parts of the lanterns. The forest was eerily calm. As an adult, I have a recurring nightmare about being surrounded by large aquariums that are overgrown with algae and contain fish that have been forgotten but that have somehow survived on their own. Usually, the fish are huge, or have lost their color, or have mutated in some way. During the course of the dream, the fish begin to swim out of the tanks and into the air around me. It is a terrifying nightmare, and I have been having it for about 15 years. Having to climb a five-storey, very narrow, rickety fire escape outside of a brick building … fleeing from a serial murderer psychopath that had left dismembered body parts under my bed. Scariest dream I ever had happened in my 40s. I walked into a grocery store, bought some stupid thing (not important), and went to the cashier to pay for it. They looked at me and said they needed exact change. I smiled, said, “No problem,” and pulled a shotgun out from under my long coat and pulled the trigger. When it went off I woke up in a pool of sweat. I could still feel the recoil of the shotgun in my shoulder and hands. That I could jump, and each jump would take me higher, but quickly there was one jump that was too high and as I came down I knew it was going to kill me, painfully. When I was 12 my mother had a particularly underpowered car that took ages to reach up to speed. One night I dreamed we were driving along a long straight local road we called “no man’s land” and the car was being chased by an enormous gray rubber wolf. The car was failing to gain speed but the rubber wolf was, he wobbled but still managed to catch us up and as he reached us I woke up. I swear I could see him standing in the corner of my bedroom breathing heavily. I’m 46 now and still think of it. When I was six or seven, I had a recurring nightmare of a hideous, wrinkled hand, sticking out of my bedroom wall. The ancient hand and forearm were covered with blotchy gray skin, and the nails were yellowed, pointed, and cracked. The hand beat on the floor, accompanied by a thudding drumbeat, commanding my attention, drawing me to it. I couldn’t sleep for days, weeks, for fear of this horrible hand reaching out for me. Finally, I grabbed it, and it pulled me through the wall and into a cage hanging in a cavern. Below me, a witch was stirring a cauldron full of bubbling goop, and I was the next ingredient. After being pulled through the wall, I never had the dream again. The corpse of “Ethel Mertz” (from the I Love Lucy show) rose from her grave and came after me. Scary and funny! I wake up in the back room of my parent’s lake cottage in rural Pennsylvania. It’s the dead of night, in winter, and I immediately know that there is no other person within miles. The only light is a very faint blue glow coming through a crack in the door. I’m already terrified, yet I can’t stop myself from going toward the source of the glow. As I move through the door and down the back hallway I’m not walking—I’m bounding in slow motion, as if I’m on the Moon. My breathing is very loud in my ears, the sharp sound of a respirator kicking on and off with each breath. As I near the end of the hallway the glow continues to get brighter, and I want desperately to not see what’s around the corner, but I keep slowly bounding forward. A high-pitched whine has been growing as I begin to turn the corner, and the entire front room is lit up by the blue glow. The whine rises into an ear-splitting shriek of sound as I turn my head to see the source of the glow—and I wake up. I dreamed this approximately 40 years ago. I was told (or just “knew”) that I would be murdered by a man named John Cavenaugh. I was walking through the expansive backyard of an old abandoned house. It looked like autumn—all of the trees were dead and black, and the sky had this orange tint to it. I came across a small basin (ankle high) with cobwebs, dead leaves, and some small drops of a tar-like substance inside. 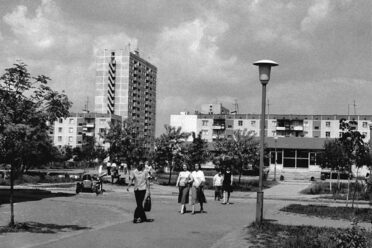 Standing in the center was a metal framework that roughly looked like the outline of a human body, but off. It reminded me of a medieval torture device. I heard a voice behind me say the following: “They say a woman used to live in this house. She was deformed and looked like a seal. She used this framework to press her back into shape.” Woke up sweating and panting. Everything is white. I hear the faint sound of a slow heartbeat. The beating starts to get louder. Louder. Faster. In the distance something is moving toward me, spinning. Louder. Faster. The objects are getting closer moving in a spiral motion. LOUDER. FASTER. The objects become clearer, I realize they are individual human organs. The heartbeat is racing, the organs cloud my vision as the sound of a scream envelopes me. I wake up. There was a full moon shining down on my bed. Suddenly there was a woman standing beside the crib. She was haggard and had black holes where her eyes should have been. She reached her long sinewy arms with long white fingers ending in long nails and she pushed the covers up under my chin. I had pushed them down to my feet. I could cry, or move. She pressed the covers hard on my chest. She stood there for some time. I finally shut my eyes and when I opened them, she was gone. I had this dream as a child of about four or five years old: I’m riding bikes with neighborhood friends. One boy stops so we all stop around him. He pulls out a tube of what looks like toothpaste, takes the cap off, spreads some on his wrist, and then pops his hand off at the wrist, leaving a ball and socket hand and wrist. No blood, just a perfect, doll like arm. He then wants to put the goop on our necks to pop our heads off, and we all take off on our bikes in fear and he’s chasing us. I make it to my house, dump my bike and run inside and hide behind a couch, heart pounding. I woke myself up in such fear of that kid and his magic solution that I’m calling out for my dad and mom. My dad came in to check on me, but I thought the kid had gotten to my dad already and that my dad’s going to pop HIS head off to show me it was fine, it doesn’t hurt. Took a while for me to shake that dream state off. Being chased by sentient tornadoes. They always know where I’m hiding. We asked which places gave you "fernweh," and you gave us poetry! Maere, mara, mahr, mahrt, mårt—by any name, it was and still is a terrifying visitor.